There is no feeling in the world quite like returning to a picture book you loved as a kid, only to discover how weird or disturbing that book was all along. A lot of adults experience this when they first have kids of their own and want to read them the books they used to love. The green elephant in Babar. The unapologetic nudist in In the Night Kitchen. And then there’s Curious George. That happy little monkey has long since had his adventures adapted into movies, television shows, spin-offs, and even iPod apps. But when you go back and reread the original stories you may find yourself more than a little perturbed by what he experiences. Michael Rex sure was. In an interview on the Michael Spradling blog Rex said, “I love H.A. Rey, but the way that everyone treats George in those books is awful. That man yanks him from the jungle, ties a rope around his neck, makes him work for no money and then puts him in a ‘documentary’ they shoot on a stage! They even send him up in a test rocket and he blacks out. Not only that, but they keep calling him a monkey, and he’s an ape! He has no tail! And what about George’s parents? Don’t they miss him? It’s just getting me furious thinking about it…” The answer? The final picture book parody penned by Rex. 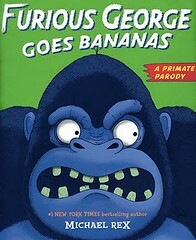 What started with Goodnight Goon and Runaway Mummy (hat tips to Goodnight Moon and Runaway Bunny there) ends with Furious George Goes Bananas. He’s big. He’s purple. And he’s not gonna take it anymore. George is a happy gigantic ape, living his life in the jungle, when one day a man in a funny hat tricks him with a pile o’ bananas. Before George knows it he’s transported across the sea where the man immediately sells him to a zoo. Kept in a tiny cage away from his home, “GEORGE WAS FURIOUS! HE WENT BANANAS!” So the man in the funny hat sells George to a construction site. Things, as you might expect, go equally well. Then it’s a Broadway show. Then it’s outer space. Eventually George figures that if he’s going to get back home, he’s going to have to do it himself. And with some clever planning (and trickery involving the man in the funny hat’s money pile) George finds a way to get back where he really belongs. The original Curious George has been accused of a lot of things, most prominently amongst them a jovial look at imperialism. George is kidnapped from Africa and taken forcibly across the sea on a boat to a new land. For a while there, that was quite the hot button issue. The thing about Furious George, however, is that it just really gets down to the basic issues about why George has every right in the world to become furious. It doesn’t even have to go after the worst slights done to the original George either (his vomiting up ocean water, his sniffing ether and conking out, etc.). As Rex (who, ironically, will be shelved right next to actual Curious George books in libraries due to his alphabetically correct last name) says on the book’s bookflap, he “always wondered why little George put up with so much nonsense.” Now we can wonder too. The art is rather fascinating too. First off, there are the colors to consider. To avoid looking anything like the colors of Curious George this book goes in for a lot of purples and greens and oranges. There are also fun details to look at. For example, the man in the funny hat’s clothing grows more and more prosperous every time he hires George out to somebody new. The hat generally stays the same (except for the red jewel that appears in it after he’s wealthy) but the clothes go from jungle gear to a nice suit to spats to ermine. The book is also playing off of various Curious George themes (George in a zoo, George goes to space, etc.) but I am personally convinced that when George has to perform on a stage, his freak out owes more to King Kong than any H.A. Rey creation. As for the story itself, it actually stands on its own just fine. I think any kid can sympathize with a creature taken out of its natural habitat that just wants to go home. I wouldn’t be surprised if animal rights activists make Furious George their go-to book in years to come. I also loved that there was a running gag in the story of the man in the funny hat calling George a monkey only to be corrected over and over about the fact (he never remembers) that George is an ape. I guess the natural question to ask is whether or not reading Furious George Goes Bananas will make kids think differently about H.A. Rey’s classic predecessor. Maybe a little. But there’s nothing wrong with children understanding how strange the original book was in terms of kidnapping a primate and then calling him the wrong animal over and over again. Furious George is also different enough from Rey’s book to do what its predecessors (Goodnight Goon, Runaway Mummy) did. The people who don’t like Curious George will find this delightful, and the die-hard Rey folks will get the joke and love it too. A book for everybody! Or at least, big purple gorilla fans. Source: Reviewed from ARC supplied by publisher. Misc: It’s probably best that you not get this book mixed up with the punk rock band of the same name. I’ve been looking forward to seeing this book since I heard about it at a Kidlit Cafe! I have never been a fan of Curious George- for the reasons noted above and a few of my own- but I have always loved how the original manuscript was among the few belongings the authors took with them when they fled Paris in 1940. That said, my dislike for the books probably fueled my admiration for the punk band Furious George, so I’m glad you noted them here. Who doesn’t need some 3-chord punk rock now and then? The punk band was the first thing I thought of! I thought in his old NYPRESS column that George Tabb went on at length about them being sued by the publisher/author’s estate for trademark infringement due to the name. I wonder if Putnam’s legal eagles have any concerns on this point. Well, as I’ve noted, they bent over backwards to make sure that the similarities to the original were minor. Even the balloons in the zoo were different colors. Trust me. They’re being veeeery careful. Some people live in houses, and some people live in apartments — like Curious George and Great-Grandma.